An unexpected ‘star of the show’ at the 2012 Pack Expo, the Series 1600 Washdown Turntable, with its sorting, accumulation and directional change capabilities, is ideal for the pharmaceutical, food manufacturing, bottling and canning industries. 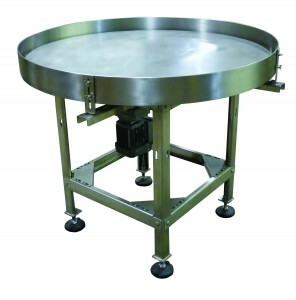 Our sanitary Series 1600 Washdown Turntable is manufactured in the USA using 304 stainless steel. This long-lasting machine was specifically designed for food and pharmaceutical-safe applications, featuring extremely quiet operation, quick and easy cleaning and a low operating cost. The Series 1600 can be customized for industry-specific needs. Options include Nema 4X variable frequency washdown drives, a plastic or domed top, a stainless motor and reducer, UHMW-PE side guides and stainless steel casters. Complete customization is possible with specified cut-outs on the outer rail, side tables, in-feed chutes, diverters and conveyor tie-ins. To learn more about the Series 1600, visit www.Eaglestone.net to contact an Eaglestone representative for a product brochure or to receive a quote.